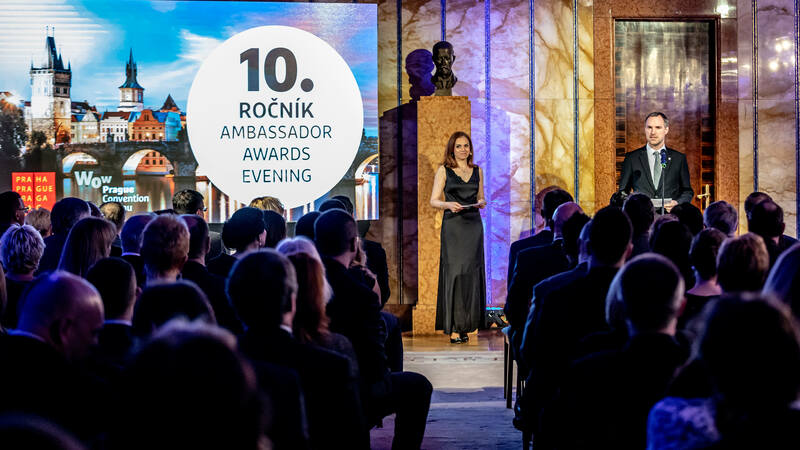 Prague, 4 April 2019 – The Prague Convention Bureau paid tribute to the distinguished Czech scientists, professors, physicians and other elite experts for their contribution to the Prague meeting industry, at the 10th Ambassador Awards Evening. The award ceremony took place on 3 April 2019 at the Residence of the Mayor of Prague. Ambassador Awards Evening celebrates the 10th anniversary of its founding this year. More than 40 Prague congress ambassadors were present at the anniversary ceremony. The event was held under the auspices of Mr. Zdeněk Hřib, Mayor of the City of Prague, who attended the ceremony in person. Prague was the first place in the CEE region to host the EuroELSO, and simultaneously the first place to welcome more than 1500 participants in the event’s history. The programme of the congress included so-called life case sessions - commented surgeries live-streamed from the Military University Hospital. The conference programme comprised a number of workshops at the University Hospital Motol, including the first unique live-streamed brain surgery. The Prague Congress recorded the largest number of delegates in the event’s history, and the programme innovations initiated by professor David Škouloudík started a new era of the ESNCH meetings. Prague won the Congress with the anticipated number of delegates 5,000 after two previous attempts, which had no success due to a broader science base of other competing destinations. Therefore, the third candidacy was presented as a joint candidacy of Prague, of the Czech Republic, and of the entire CEE region where the Congress had not been held for long 14 years. As a result of this strategy, Prague defeated its competitors, such as Munich or very favoured Paris. The local organizing committee consisted of reputable Czech experts and representatives of the specialization from Austria, Poland and Slovakia. Zentiva Group chose to collaborate with Czech companies and incorporated a walking treasure hunt teambuilding activity focused on exploring Prague into its programme. The concept of the event was designed to achieve high level of the cooperation engagement with the participants employing the top AV technology. The catering services were composed as a festival of food and beverages from the sixteen countries where Zentiva Group is established. Professor Vlček belongs to the leading contemporary personalities of the Czech pharmacoepidemiology and clinical pharmaceutics. He has made a number of crucial contributions towards organization of many significant scientific events, such as the European Symposium on Clinical Pharmacology 2013, European Symposium on Patient Adherence, COMpliance and Persistance 2015, Annual Meeting of the International Society of Pharmacovigilance 2015 or the International Conference on Pharmaco-Epidemiology and Therapeutic Risk Management 2018. The annual congress returns to Europe only once every three years. Representatives of the Czech Society for Analytical Cytometry had already aspired to organise the congress since 2010. The Czech metropolis undoubtedly profited from the fact that docent Kalina had been elected into the ISAC board in 2016, and he could lobby the board members for Prague personally. From the scientific and from the organizational point of view, the Congress was a huge success, and with the number of delegates as high as 2,000 it became the largest congress in the history of ISAC. „I would like to use this opportunity to express our gratitude to the ambassadors awarded this year, and to all our congress ambassadors. Their active engagement into the process, starting from the candidacy and ending with the congress itself, requires a great amount of their effort and patience. The awarded and nominated congresses often hold many primacies and records indicating the increasing attractivity of Prague as a meeting destination. Local scientific community can thus profit from numerous opportunities to develop and improve its knowledge in a wide range of scientific fields,” adds Lucie Čapková from the Prague Convention Bureau Ambassador Program. The 2019 award winners were chosen by an independent committee: prof. RNDr. Eva Zažímalová, CSc., Chairwoman of the Academy of Science of the Czech Republic; Ing. Irena Vlčková, General Director of the Union of Trade and Tourism; JUDr. Renata Králová, Director of the Tourism Department at the Ministry of Regional Development; Jan Wolf, Councillor of the City of Prague for Culture, Heritage, Exhibitions Management and Tourism and prof. MUDr. Karel Cvachovec, CSc., MBA, Patron of the Ambassador Program. The Ambassador Awards Evening was held with the support of Prague City Hall, CzechTourism agency and Czech Convention Bureau. The event was moderated by Veronika Paroulková. Prague Convention Bureau (PCB) is a non-profit organization established in 2008. The company acts as an official representative of the Prague congress tourism and promotes the city as a one of the European leading congress destinations. Together with Czech tourism bodies, partners and members the PCB offers effective assistance in organizing conferences, meetings, seminars, exhibitions and incentive events in Prague. Ambassador Awards Evening is a part of the Prague Convention Bureau’s Ambassador Program – strategic program focused on a promotion of Congress Ambassadors – local representatives of international professional associations in Prague and the Czech Republic. Among others, the program offers many educational and social events to support Congress Ambassadors in their effort to bring international conferences in the destination.